Yamaha finally announced it’s plans to bring the much-hyped and much-yearned-for Ténéré 700 Adventure bike. Cypress, CA – November 5, 2018 – Yamaha Motor Europe (YME) today introduced the all-new Yamaha Ténéré 700 Adventure Touring motorcycle during an exclusive press conference in Milan, Italy, and Yamaha Motor Corporation, U.S.A. (YMUS) announced that this exciting all-new motorcycle would also be produced for the U.S. market. Production for the European model will take place in France, while production for the U.S. model will take place at Yamaha’s factory in Japan. Due to differing government regulatory standards and factory production line schedules, the all-new Ténéré 700 is scheduled to arrive at U.S. dealerships in the second half of 2020. Yamaha U.S. also announced the return of the flagship Super Ténéré ES as the company’s 2019 Adventure Touring model. Arriving at dealerships beginning in November 2018, the 2019 Super Ténéré ES will be available in a Ceramic Ice color scheme for an MSRP of $16,199. The Ténéré can trace its roots back to the launch of the XT500 enduro-adventure bike in 1976. This versatile motorcycle became an instant success thanks to its single cylinder four-stroke engine with strong torque and a compact chassis. Its go-anywhere ability, rugged design, and outstanding reliability opened up a new world of adventure to many motorcycle riders. These same qualities made the XT500 the ideal choice for competitors in the very ﬁrst Paris-Dakar Rally in 1977, demonstrated by Cyril Neveu’s victory on the bike. The XT500 quickly established a reputation as the toughest desert rally bike, and it became the default model for adventure-seeking riders and rally racers alike. Today, the XT500 is considered one of the most signiﬁcant and iconic motorcycles of the late 20th century, with active owners’ clubs throughout the world. The Ténéré line-up was constantly evolving and growing, and the end of the 1980s saw the introduction of the two-cylinder XTZ750 Super Ténéré, followed in the early 1990s by the single-cylinder XTZ660 Ténéré. During this period, Yamaha’s Ténéré motorcycles won many more Dakar Rally events, with Stéphane Peterhansel claiming six victories on his XTZ750-based Factory Yamaha race bike in the 1990s. The ﬁrst sign that Yamaha was developing a new Adventure Touring motorcycle came with the launch of the T7 concept in 2016. Displayed at motorcycle shows all over the world, it created immense interest and gave riders a taste of what was to come. In 2017 Yamaha introduced the Ténéré 700 World Raid prototype that was one step closer to the final production specification. Since then, the Ténéré 700 World Raid prototype has undergone an intensive world tour in various key locations all over the globe. During this development phase, the bike was subjected to the most extreme testing in hostile terrain and severe climatic conditions. Piloted by a team of professional riders including multi Dakar winner Stéphane Peterhansel and Oﬃcial Yamalube Yamaha Rally Team riders Adrien van Beveren and Rodney Faggoter, the World Raid prototype was pushed to its limits across the globe, from Australia’s unforgiving outback to the brutal South American deserts. While accounting for thousands of hours of testing on the development bikes, the Ténéré 700 World Raid program also showcased the design of the motorcycle to many hundreds of local riders who were invited to give Yamaha their valuable input and help shape the final production model. With a spirit of adventure embedded within its DNA, every Yamaha Adventure Touring motorcycle is rugged, tough, and reliable. Each Ténéré model opens the possibilities of endless travel and enables riders to discover a feeling of untethered freedom. Thanks to Yamaha’s in-depth oﬀ road expertise, the all-new Ténéré 700 is a lightweight, no compromise Adventure Touring motorcycle with one of the highest speciﬁcations in its class, and one of the most exciting and signiﬁcant new Adventure models to be launched in many years. Equipped with the successful CP2 689cc parallel-twin engine and an entirely new chassis, the Ténéré 700 is designed to deliver class-leading handling and agility in the dirt – combined with high-speed long-distance performance on the road – making it an extremely capable and versatile motorcycle. Yamaha has revolutionized the motorcycle world with the development of the crossplane concept engines that power a range of the company’s best-selling models, and the new Ténéré 700 is equipped with the highly respected 689cc parallel-twin engine. The key characteristic of this compact CP2 engine is its strong and linear torque output that gives instant throttle response together with outstanding acceleration – attributes that make it a capable and versatile performer on and oﬀ the road. Producing maximum torque at 6,500 rpm, this engine provides the ideal balance of performance and controllability, and its excellent fuel economy contributes to the Ténéré 700’s ability to cover long distances between fuel stops. To cater to the unique requirements of Adventure Touring riders, the ﬁnal transmission ratio is optimized for both road and off-road operating conditions. Together with a range of model-speciﬁc fuel injection settings, these features contribute to the bike’s outstanding versatility and remarkable performance in different riding environments. During the development of the Ténéré 700, one of the key goals was to achieve a slim, agile and light feeling chassis that would be equally suited to both road and oﬀ-road riding. To satisfy these requirements, Yamaha’s designers have developed an all-new lightweight double cradle tubular steel frame that combines low weight with immense strength, making it ideally suited to a variety of riding conditions. Featuring a compact 1,590mm wheelbase and a slim body, this rugged chassis delivers responsive handling characteristics, and with 240mm of ground clearance, the Ténéré 700 is designed to help its rider conquer the roughest terrain. The ability of a rider to shift their weight and position on the bike is crucial for maintaining full control in oﬀ-road riding situations, so the Ténéré 700 is equipped with a ﬂat seat and slim body that allows maximum rider agility. The compact bodywork and narrow fuel tank also enable the rider to grip the tank with their knees whether sitting or standing, giving added conﬁdence and control in every situation, whether riding on dirt or asphalt. The new Ténéré 700 comes equipped with a distinctive looking headlight assembly that is a direct spin-oﬀ from Yamaha’s latest factory rally bikes and the T7 concept machine. A total of four LED headlights project powerful beams of light that can illuminate the darkest wilderness. Stacked in a two-plus-two layout and protected by a clear nacelle, along with two LED position lights at the base, this strong face gives a purposeful look that matches this new Adventure Touring bike’s imposing character. The Ténéré 700’s long travel forks are undeniable evidence that this is a serious Adventure Touring bike with class-leading off-road capabilities. The flex-resistant 43mm upside down coil-spring forks stay composed over the most extreme terrain to provide precise steering and smooth suspension action, while 210mm of suspension travel enables the rider to attack the most challenging oﬀ-road terrain with confidence. Featuring full damping adjustment, these rally-speciﬁcation front forks ensure high levels of comfort with lightweight handling performance when on the road, making the Ténéré 700 one of the most capable and enjoyable long-distance tourers. 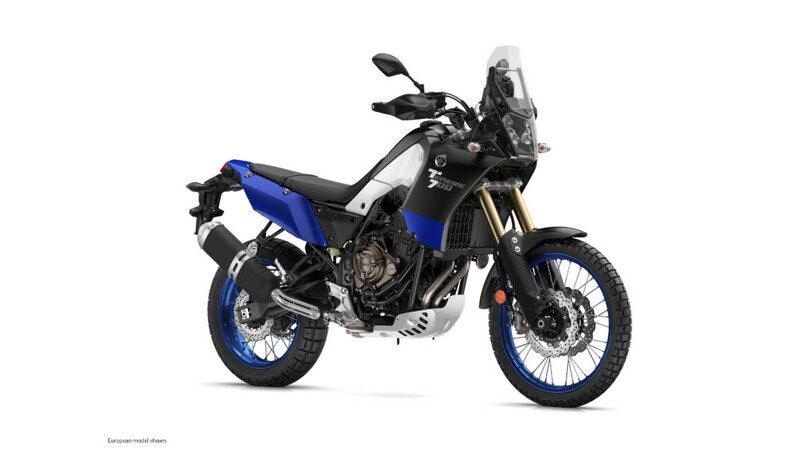 The Ténéré 700 features a rally-bred link-type rear suspension system that provides smooth and progressive action for maximum riding comfort and enhanced levels of control. Featuring a lightweight aluminum swingarm for low un-sprung weight, this high speciﬁcation rear end oﬀers 200mm of travel which, like the front suspension system, is designed to handle the most severe oﬀ-road riding conditions while producing a comfortable ride on the road. Another signiﬁcant feature is the remote preload adjuster that provides quick and easy adjustment to suit riding conditions. The rally-styled faring and windscreen on the new Ténéré 700 exhibit pure Dakar character. The compact rally screen and nose fairing give you excellent protection from the wind while maintaining the slim and lightweight character of the bike, and the competition type tapered handlebars give a relaxed riding position whether you’re seated or standing. Just like the high speciﬁcation front and rear suspension, the spoked wheels demonstrate that this bike is built for serious oﬀ road riding. With their ability to eﬃciently absorb the continuous impacts experienced when riding in rough terrain, these lightweight wheels work with the long travel suspension to give the rider optimum handling performance and control. Because the Ténéré 700 features a competition type 21-inch front wheel/18-inch rear wheel combination, riders have the option to ﬁt a wide range of tires to suit their requirements – ranging from a pure enduro pattern for predominantly oﬀ-road use, to dual sport pattern tires for on/oﬀ-road versatility. Throughout the development of this new generation Adventure Touring bike, Yamaha’s principal goal was to ensure that the Ténéré 700 would deliver class-leading oﬀ-road performance together with outstanding on-road capabilities and provide genuine long-range potential. The slim design of the fuel tank belies its 4.2-gallon capacity, and its narrow rear section oﬀers plenty of rider mobility and excellent knee grip. Whether sitting down or standing up, the compact dimensions of this long-range fuel tank enable the rider to shift their weight around eﬀortlessly. Thanks to the excellent economy of the twin-cylinder engine, 4.2-gallons of fuel provides an approximate average 217-mile fuel range which gives the new Ténéré 700 a high level of all-terrain versatility. Another example of how the new Ténéré 700 has been developed using rally-bred technology can be seen with the compact rally style instruments. Located centrally behind the screen for great visibility, this lightweight instrument panel displays a wide range of information that can be absorbed by the rider without having to take their eyes oﬀ the road or trail. The multi-function LCD display features two trip meters and comprehensive information including gear position, fuel level, estimated fuel range, average and instant fuel consumption and more. The cockpit is designed to accommodate the ﬁtment of aftermarket navigation devices, enabling riders to add extra equipment to suit their requirements, including GPS, road book readers and smartphones. The braking system consists of dual 282mm wave-style front discs and a 245mm wave-style rear disc that provide high levels of stopping power with plenty of feel at all speeds on the road or in the dirt. When riding oﬀ-road, the rider has the option to temporarily disable the ABS by activating a switch while stationary. With the ABS turned oﬀ, the rider can take full manual control and choose to lock the rear wheel deliberately in certain off-road situations. On long journeys, the screen and front cowl provide protection from the wind and weather, and thanks to the bike’s slim and compact body design, the rider can tuck in tightly to the chassis and keep out of the main airﬂow. As well as deﬂecting wind and rain, the tough plastic handguards offer added protection from branches and foliage when riding in the wilderness, and help to protect the levers and throttle from accidental damage. The new Ténéré 700 will be available in a Ceramic Ice color scheme during the second half of 2020 at Yamaha dealers across the U.S.A., and the MSRP will be announced at a later date. To see a video of the all-new Ténéré 700, visit https://youtu.be/w41PdphNPeI. To find out more about Yamaha’s Adventure Touring motorcycles, visit https://www.yamahamotorsports.com/adventure-touring.